What would life be without passion? There are many things that I'm really passionate about, writing, playing Legos with my son, good beer, riding my bike for 100km on a sunny morning and watching my favorite soccer team, the Montreal Impact. I'm pretty sure that early morning beer drinking and cycling is a bad idea, and I'm not too keen on beer drinking and Legos, but writing? About beer? And soccer? That's probably the most stimulating thing I've had to do in a while. What I'm going to do is simple, I'll take you through three days in beautiful Montreal; from the moment you check into your hotel Friday afternoon to the moment you leave on Sunday. Before we start, let me tell you something about beer and Montreal: the first thing that should come to your mind now is Molson. Let me say you're far from wrong. The Molson brewing company was founded here in 1781. That beer is still brewed here. The name Molson is visible at many points in this city. The local football team plays at Molson Stadium, the Montreal Canadiens hockey team is owned by the Molson family, there's rue (street) Molson and the John Molson school of business at Concordia University. All that is nice, but it's not a reason not to try to drink something else. Friday 4pm: You just checked into your hotel, probably downtown or in the old port. The first thing to do is to get out of there and explore your surroundings a little, maybe you could find a place to buy a gift for your girlfriend who stayed at home, or maybe you could find a nice place to have the late breakfast you're probably going to need at some point. Friday 5pm: It's now time to make yourself familiar with the Metro system. It's made up of four lines, identified by colors. For the little trip I'm planning you should ask for 6 tickets, it's cheaper to buy them that way and that should be enough. The only thing you have to remember is to validate your tickets when you enter the station, keep it with you for the duration of your ride. You should also be ready to walk a little, it's the best way to really discover the city, or any city for that matter. Friday 6pm: Time to eat! You'll start your week end at one of the most classic place in Montreal, Schwartz. This old deli is a must for everyone who comes here and despite the fact that lots of tourist come to this place it still is a favorite of the locals. To get there take the Metro and stop at Sherbrooke station on the orange line. Get out on rue St-Denis, go through the park in front of you (Carré St-Louis) and find rue Prince Arthur on the other side of the park. Walk away from the park until you get to boulevard St-Laurent then turn right. After that keep walking until you get to number 3895. It's on the right side if you're facing north. If you weren't hungry at the beginning of your trek you should be now because it's a good 20 minutes walk you just did. Now that you're here just do like everyone does, order a smoked meat sandwich, "Bon appétit". 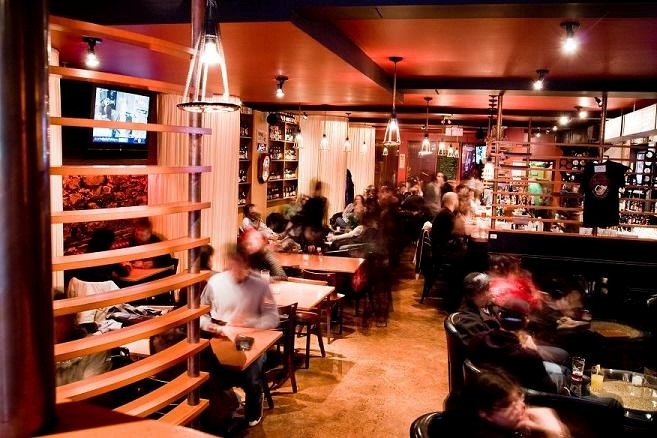 Friday 7pm: Hail a cab (or walk for 20 min) and go to Dieu du Ciel (29 rue Laurier Ouest). This place is definitely away from most tourist spot, but it's the best microbrewery in Montreal. The tricky thing now is to find yourself a place because this pub is small and extremely popular. If you're lucky enough to find a table hang on to it, it's worth it. Most of the beer is brewed here, but they also have another brewery north of Montreal. They always have close to 20 different beer on tap and they update their menu daily. Péché Mortel is my favorite. It's an imperial stout with a coffee taste and high alcohol percentage. Just be careful with it, as I like to say in French "ca fesse fort". Friday 10pm: By now your alcohol level is probably a bit high, maybe you should go for a walk. Follow rue Laurier towards the east until you get to St-Laurent then head north until you get to Vices et Versa (6631 boulevard St-Laurent) it's a 2km trek (a little bit over a mile). This is the place to taste the best beers that are made in "la belle province". Many different microbreweries sell their product here and the menu changes regularly. Just ask the staff what they recommend. If you're hungry they also serve some snacks. Saturday 1am: The metro is closed, take a cab back to your hotel and get some sleep. Saturday 8am: Come on, it's time to wake up. I know it's early morning and you were out late last night, but it's soccer time. If you're here during the European season you need to find a place to watch the games. I suggest Burgundy Lion Pub (2496 Rue Notre-Dame, Métro Lionel Groulx green/orange line) close to canal Lachine. They open at 9am and show the premiership every week end. If you're here during the summer you might want to catch some of the action at the Euro. If Italy plays I suggest you go to one of the cafes in the little Italy. Just take the metro to De Castelnau station (blue line) and head south on St-Laurent. If you're lucky Italy will win and you'll see the celebration that usually takes place afterwards. Saturday noon: You're probably tired a little bit now and hungry too. If you were in little Italy you should go to Jean Talon market and buy some snack for a picnic. Then, take the metro again and go to Mont-Royal station (orange line). Once outside take bus #11. It will take you to the top of the mountain where you can finally eat that snack and take a little nap in the grass (if you're here in March or April it would probably be a better idea to take that nap in your hotel room). Saturday 3pm: You're now "frais comme une rose" so it's time to move on. The best way to really wake up is simply to walk down the mountain. Try to head south so you arrive close to downtown. If you haven't done it already it's probably time to buy that souvenir for your girlfriend. Rue Ste-Catherine is quite good for shopping. Saturday 4:30pm: Still on Ste-Catherine? find a place called Les 3 Brasseurs. There is one close to rue Crescent (1356 Ste-Catherine Ouest) and another one close to rue Université (732 Ste-Catherine Ouest). This place is a restaurant chain from France and they make decent beer. To go with that they also make decent food. Perfect for a pre game snack. Saturday 5:30pm: Finally, it's close to game time! Take the metro again and head for Pie IX station (green line). The first thing you have to figure out is where the game is played. If it's at Stade Olympique just follow the crowd in the tunnel that leads to the main entrance. 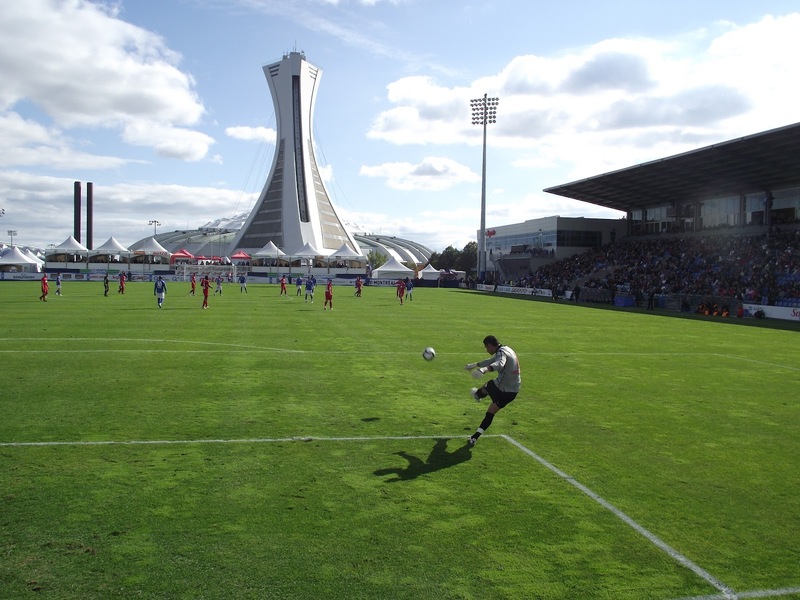 If it's at Stade Saputo you will have to go outside and walk around the Big O. Stade Saputo is just at the top of the little hill close to the tower. It's now time to talk about the Montreal Impact. Expansion team they might be, but just like the Seattle Sounders, the Portland Timbers and the Vancouver Whitecaps, they are far from being new. They played their first game in 1993 in the APSL. The next year they won their first championship. They won championships in 2004 and 2009 too, but this time in the USL first division. The team was also able to qualify for the CONCACAF Champions League quarterfinal. In February 2009 a crowd of over 55000 people packed the Big O to see the Impact win 2-0 against Mexican opponent Santos Laguna. At the beginning the team was owned by the Saputo family, around 2000 it was sold, but the new owner went bankrupt and the team nearly folded. The Saputo decided to get involved again and the Impact became a non-profit organization with Joey Saputo as president. From that moment everything started to fall in place for Montreal, attendance went up and soon Centre Claude Robillard where the team was playing became too small. The family decided to build their own Stadium with a bid for MLS expansion in mind. Last year that dream finally came true and once the expansion of Saputo Stadium is done the Montreal Impact will be able to say "mission accomplie"
Throughout its history local players were always a big part of the identity of the team. Players like Mauro Biello (assistant coach in 2012), Nick DeSantis (technical director in 2012), Gabriel Gervais, Rudy Doliscat, Patrick Diotte and Nevio Pizzolitto were the backbone of the team. Many members of the Canadian National team also were a part of the Impact during their career, most notably Jason DeVos, Sandro Grande and Ali Gerba. Today it's up to Brossard native Patrice Bernier to carry the torch. He first played with the Impact in 2000 before moving to Europe where he played until last year. Saturday 7:30pm: I'm really sorry for the crappy beer inside the stadium. Saturday 9:30pm: Game over, sorry your team lost. You'll probably need to drown your sorrows in a good beer. Hop back on the metro and get out at Berry-UQAM station (green, orange and yellow line). Exit on rue St-Denis and walk north for 3 minutes. Stop at St-Bock (1749 rue St-Denis) where you will be able to eat some good pub fare while drinking one of their excellent beers. If you want they also serve some beers from other microbreweries and have a huge selection of imported bottles. Saturday 11pm: Maybe a change of scenery would be good. Get out and walk one little minute north to l'Amère à Boire (2049 rue St-Denis). This is your chance to travel a little bit by tasting their brew inspired by Czech beer, the Cerna Hora. If that's not your style you can try l'Amère à Boire, it's a bitter that is usually served from a cask. Personally my favorite here is a German inspired beer, the Vollbier. Sunday 1am: If you can still walk you still have the time to visit one last place tonight, go north on St-Denis and turn left on rue Sherbrooke, then walk for about 5 minutes and you will arrive at Benelux (245 rue Sherbrooke Ouest). I'd love to tell you this place has great beer, but I can't. What I remember from my last visit here is a little bit blurry, too much to drink. I guess it means it was good. Sunday 3am: Last call was 10 minutes ago, time to go to sleep again. Sunday 10am: Remember that advice about late breakfast I told you about? Now is the time to go there! Sunday noon: Time to check out of your hotel room before going back home, but maybe you want to bring a souvenir for you too? May I suggest beer? If you want the best of what the Quebec microbreweries have to offer you have to go to Dépanneur Peluso (2500 Rue Rachel est, Métro Mont-Royal). They have a huge selection of bottles from all over the province. Don't be afraid to ask questions. That's it for your soccer/beer oriented week end in beautiful Montreal. This city is definitely something special and it has a really good vibe. The people are great and there is lots of stuff to do apart from drinking great beer. 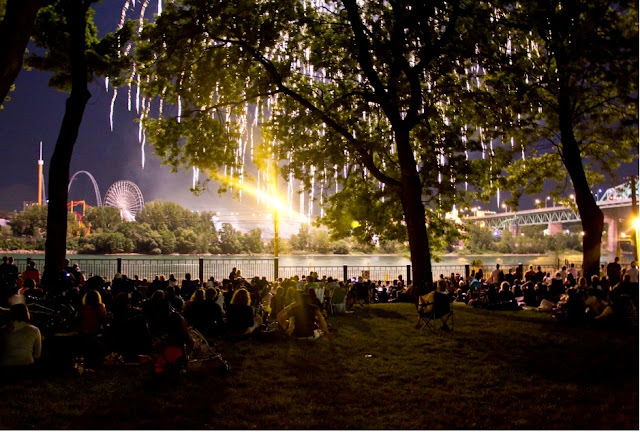 You can see free shows outside pretty much every weekend in summertime and there's also a great fireworks festival, Fantasia film festival, Formula 1 and NASCAR races, World Tour cycling Grand Prix and many other interesting event. Don't be shy, come and visit us!